Shaikh ʿAbd al-Karīm was born in 1915 in Kirpchina. He received an ideal upbringing and education at the hand of two great Shaikhs of Ṭarīqa, his father Shaikh ʿAbd al-Qādir and his brother Shaikh Ḥussein. He led an ideal Sufi life, calling people to the way of the Prophet (PBUH) by word and deed. Shaikh ʿAbd al-Karīm was generous and warm‑hearted from very early in his life. In his childhood he would ask his father, Shaikh ʿAbd al-Qādir, to give him a lamb to slaughter and distribute to the children of the village all of whom were his friends. When some adults would oppose the child’s request, Shaikh ʿAbd al-Qādir would tell them to do fulfil the wish of his young son because he saw a duty towards those children those adults could not see. The children that the child ʿAbd al-Karīm loved most were the deprived and less fortunate. He loved serving them even when he was not ten years old yet. He would stand by them in times of need, feed them from his own food, and give them precedence over himself. People saw in Shaikh ʿAbd al-Karīm much wisdom very early on in his youth. He used to wisely settle any conflicts between his friends and mend the relationships between them. This earned him the admiration of people who would inform his father of his commendable behaviour. Shaikh ʿAbd al-Qādir encouraged his son, supported his good behaviour, and nurtured his good character. Shaikh ʿAbd al-Karīm was a living example of the good qualities of his brother Shaikh Ḥussein, their father Shaikh ʿAbd al-Qādir, their grandfather Shaikh ʿAbd al-Karīm Shāh al‑Kasnazan and ultimately their great grandfather Prophet Muḥammad (PBUH). He was very generous, brave, and strong. He had a very strong charisma that forced even those who did not know him to respect him. Besides all that, Shaikh ʿAbd al-Karīm was very patient and never held a grudge against anyone. He would not be angry with anyone except when Allah’s law is violated. He was frank and succinct when he spoke. When he talked about Allah one could see the signs of happiness showing on his face. His company filled the heart with love for Allah. Shaikh ʿAbd al-Karīm loved the poor. He would bring them near to him and he spoke to them kindly. He showed much mercy and kindness towards the orphans and widows and generously helped them financially. He was very stern toward the wrongdoers and the arrogant people, so these would avoid him fearing his frankness, unless they wanted to repent. Shaikh ʿAbd al-Karīm was totally reliant on Allah and would never despair or lose hope. When asked for a prayer by someone who is in difficult circumstances, he would always say: “Allah is generous, my son!”, reminding the person that he must never lose hope. These very simple words would then work miracles for people. The Shaikh used to retreat in a small, private room in which he sat on a straw mat. In front of the mat was a small table on which the Qur’an rested. There was a sword hanging on the wall behind him. He spent most of his day alone, reciting the Qur’an and his special dhikrs and praying. He did lots of nawāfil (supererogatory worship). He used to prostrate after the supererogatory prayer of sunset, keeping his forehead on the ground until the call to the night prayer. You would hear him sobbing and weeping. He slept very little and had special dhikrs he recited. He loved to beg Allah, wept a lot, and rarely laughed. He fasted most days, at times only drinking little water, and he ate little. He did not have much of anything other than tea. Shaikh ʿAbd al-Karīm put on simple, coarse clothes. It could be a year or longer before you saw him in new clothes, as he did not like new clothes. He would have new clothes only after his old clothes had frayed. His footwear was light, cotton shoes which were worn by poor people. One great aspect of his asceticism once a person sat with him he would leave having become generous and in love of renunciation. This is one of the blessings of sitting with the ascetics. When the person sits with the people of this world, he leaves them with its love in his heart; when the person sits with the people of the hereafter, he leaves them with its love in his heart. Shaikh ʿAbd al-Karīm al‑Kasnazan emigrated to a village called Mīrkhāw in Iran where thousands of dervishes gathered around him. He stayed in Mīrkhāw for about a year before leaving to Sanandaj where thousands of people became dervishes and he left behind many takyas and khalīfas. Shaikh ʿAbd al-Karīm’s teachings are still being passed on from one generation to another. Shaikh ʿAbd al-Karīm then moved with his guiding campaign to Mashhad where whole clans became dervishes. With many thousands of dervishes now following Shaikh ʿAbd al-Karīm wherever he went, going from one place to another became difficult and costly. The Shaikh travelled around Iran, passing on his teachings of renunciation and piety, offering people valuable advice, building takyas and mosques, and resolving conflicts between people until he entered Tehran where he met lots of people. He then returned to Mīrkhāw then to Banjawin in Iraq. He lived in a village called Buban near the Iraqi‑Iranian borders where he built a takya and a home to live in with his family. His genuine Islamic teachings attracted millions of people and the light of Ṭarīqa Kasnazaniyya reached many countries such as Afghanistan, Pakistan, India, and Zambia where takyas were built and khalīfas were given the permission to preach. Finally, Shaikh ʿAbd al-Karīm returned to Kirpchina, the abode of his forefathers, the Masters of Ṭarīqa. He stayed in Kirpchina for some time before moving to the city of Kirkuk in the north of Iraq. He settled there after making many trips to most Iraqi cities such as Baghdad, Nineveh, Babylon, Najaf, Anbar, Tikrit, Arbil, and Sulaymaniyah. Shaikh ʿAbd al-Karīm built a large number of takyās throughout Iraq. When he was in Kirkuk he organized a journey of pilgrimage to Macca which was open to the poor and the dervishes. Due to the spreading of Ṭarīqa Kasnazaniyya in his time, Shaikh ʿAbd al-Karīm appointed so many khalīfas, far more than any of the preceding Shaikhs. Shaikh ʿAbd al-Karīm made his last visit to the shrines of the Kasnazan Shaikhs in Kirpchina in the company of his son Shaikh Muhammad and a large number of dervishes. Before leaving Kirpchina to go back to Kirkuk, the Shaikh visited the shrines to say farewell. But unexpectedly he came out looking very happy and sat on a chair next to the door of the mosque. He said: “My dervish sons! From today Sayyid Shaikh Muhammad is your Shaikh. This is the order of our master. The person who obeys him obeys us, the person who loves him loves us, and the person who disobeys him disobeys us.” He then turned towards the shrines and said: “I leave you and this will be my last visit to you. This is your representative that you have appointed.” At this point Shaikh Muhammad started crying, kissing his Shaikh’s hand, and begging: “O father! You are in the best of health. You have broken our hearts.” All dervishes broke down in tears in that great situation. 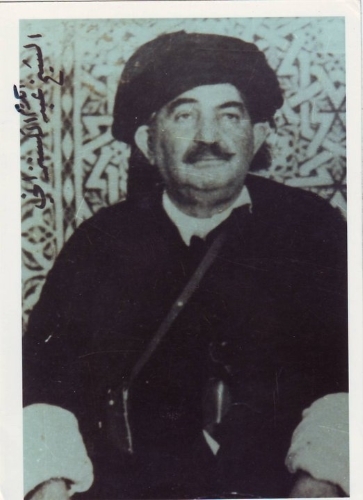 After returning to Kirkuk, Shaikh ʿAbd al-Karīm departed this world in 1978, and his body was taken to the shrines of Kirpchina that he had very recently visited. The solemn funeral was attended by numerous dervishes and people. People lined up the 110-kilometre-long road crying the loss of a great Shaikh.